There’s no place like home. There’s nothing like the warm, welcoming feeling that greets you at the door after a long day at the office. So why sacrifice that feeling when you’re on the road? Larkspur Landing’s extended stay all-suite hotels are homes away from home, inviting and authentic, designed to take the stress out of travel while fostering both relaxation and productivity. From the warm, craftsman-style design to the genuine hospitality that fills our living room-style lobbies, Larkspur Landing hotels address the single most important need of the modern business traveler: to be comfortably productive. 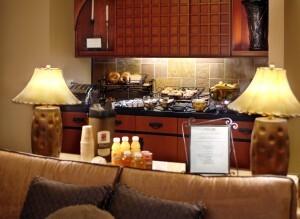 With complimentary laundry facilities, fully equipped kitchens and free wireless Internet access, the Healthy Start Continental Breakfast each morning and more, you might even say staying at one of our hotels is like visiting friends in another city—friends with a premium fitness room, a whirlpool spa (most locations) and a feather-topped sanctuary of quality sleep. Whether you’re visiting for a day or for a month, Larkspur Landing hotels have everything you need to feel comfortable, stress-free, and most of all, welcome. At The Larkspur Landing, the beauty is in the details. There’s something special about California and the Pacific Northwest that evokes warmth and character, and our hotels were built to epitomize that feeling. At each of our 11 locations, craftsman-style architecture delivers the comfort and authenticity you need for your home on the road. Its old-world charm enhanced with a contemporary touch, while a brilliant fireplace and cozy couches enrich a living room-style lobby to welcome relaxation and unwinding. In your suite, a fully equipped kitchen allows for eating in after a long day of client meetings or family outings. Dine and relax in front of your flat screen LCD TV with a complimentary DVD from our extensive movie library, or keep in touch with co-workers, friends and family members with free wireless Internet access. Despite these luxuries, some days you just want to stay in bed. Outfitted with high thread count sheets, a quilted down comforter, a premium duvet cover and a selection of delightful pillows, this exclusive feather-topped bed is a restful safe haven. Need to revise a client presentation or print a full-color report before this morning’s meeting? Faxing new plans back to the office? 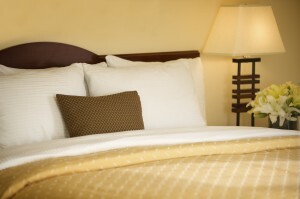 No problem if you’re staying at a Larkspur Landing hotel, fully equipped to take your busiest days in stride. 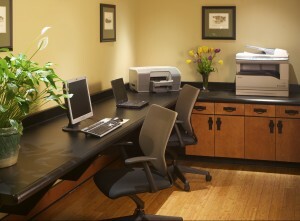 At the heart of each hotel is a 24-hour business center with complimentary amenities including computers, color printers and more. Each suite serves as a private home office, featuring an oversized work desk and free wired and wireless Internet access to keep your colleagues just a mouse-click away. Tired of slouching over a table? 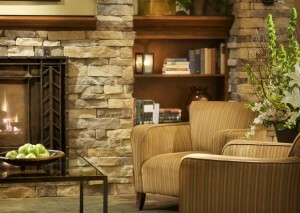 Enjoy working from the comfort of our lobby living room. Each hotel also offers a corporate meeting space equipped with televisions, phones, presentation boards and wireless Internet access, making it easy to stay in touch with your associates back home. Designed with the business traveler in mind, Larkspur Landing hotels have all the tools you need to stay connected and productive. While you’re here, you won’t miss a beat. Imagine slipping into a deep slumber, the stresses of your day dissolving into the plush sheets and cool, feathery pillows that surround you and then waking up the next morning revitalized and refreshed. 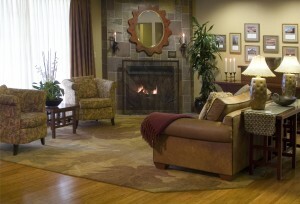 At Larkspur Landing hotels, you don’t have to imagine. We’re committed to a good night sleep, with our comfortable beds outfitted with high thread count sheets, a quilted down comforter, a premium duvet cover and a selection of delightful pillows. One night will leave you refreshed, relaxed and ready to embrace the day—if you have the strength to abandon the cozy down blankets and get yourself out the door, that is. Experts say breakfast is the most important meal of the day—and so do Larkspur Landing hotels. Our Healthy Start Continental Breakfast features an assortment of fresh, seasonal fruits, cereals, succulent pastries, bagels and English muffins, regular and light yogurts, waffles, delectable cheeses and more. With healthy options available seven days per week, you’ll have the energy you need to tackle the day, whether you’re in back-to-back meetings or relaxing in our whirlpool spa. When the smell of warm, chocolate chip cookies meets you at the end of the hallway, remember, you’re not at grandma’s house. 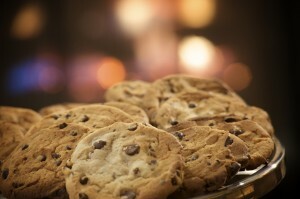 Baking fresh cookies is just one of the many things Larkspur Landing hotels do for you everyday. Why? Because our guests deserve a consistently extraordinary experience while staying with us—and who doesn’t love fresh cookies? On top of our guest suite conveniences and hotel-wide amenities, Larkspur Landings offer even more services to make you feel welcome and at ease—services such as complimentary grocery shopping to go with your fully equipped kitchen and reminder wake-up calls (in case you miss the first one) to rouse you from your ultra-cozy bed. Free laundry facilities, a first-class fitness center and an outdoor whirlpool spa (most locations) are at your convenience seven days a week, while complimentary coffee and front desk services are available in the lobby 24 hours a day. Let us know what we can do for you and we’ll go above and beyond to deliver unparalleled comfort and genuine hospitality.